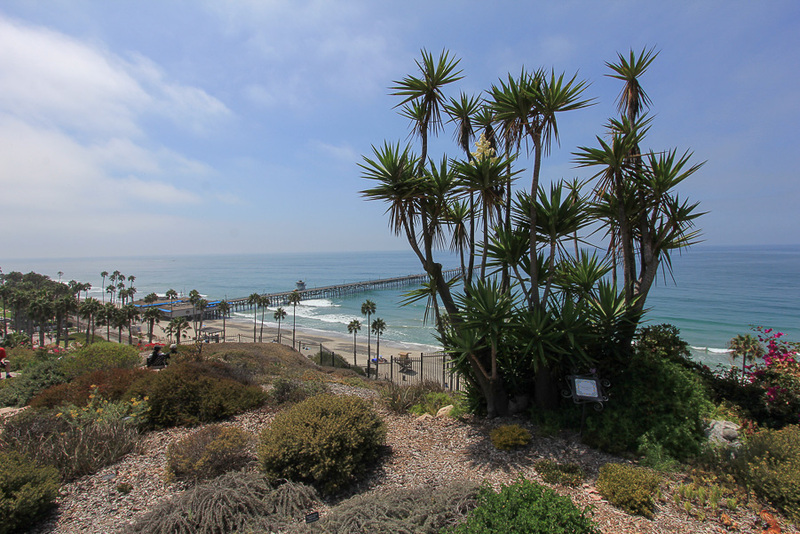 August 31, 2016 - Today we again headed to the beach to visit one of our favorite Southern California towns, San Clemente. 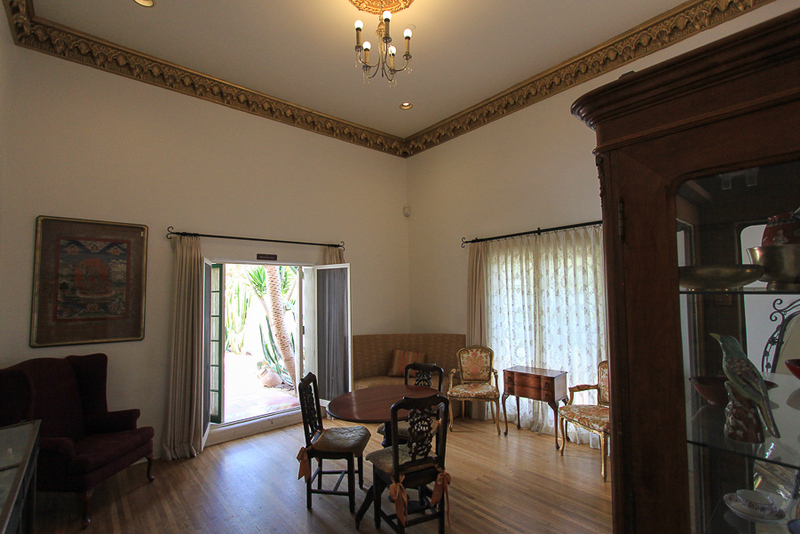 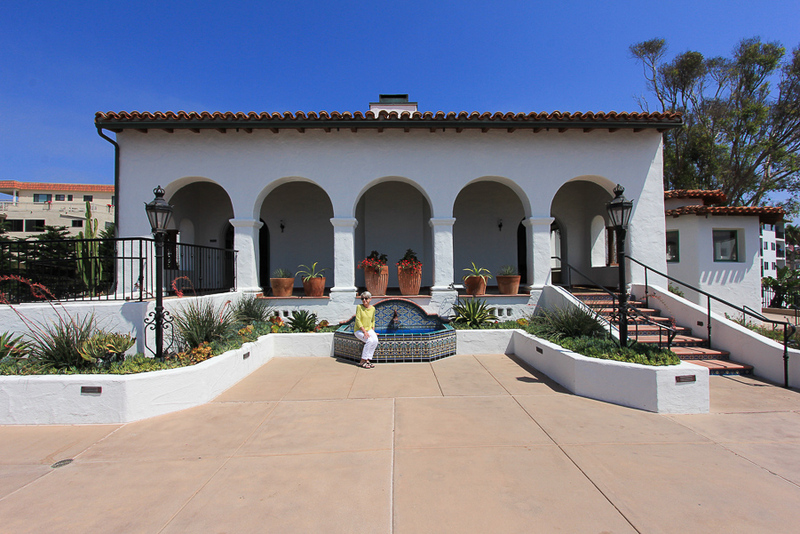 We came specifically to see the Casa Romantica, which once was a private home but now is an Orange County cultural center. 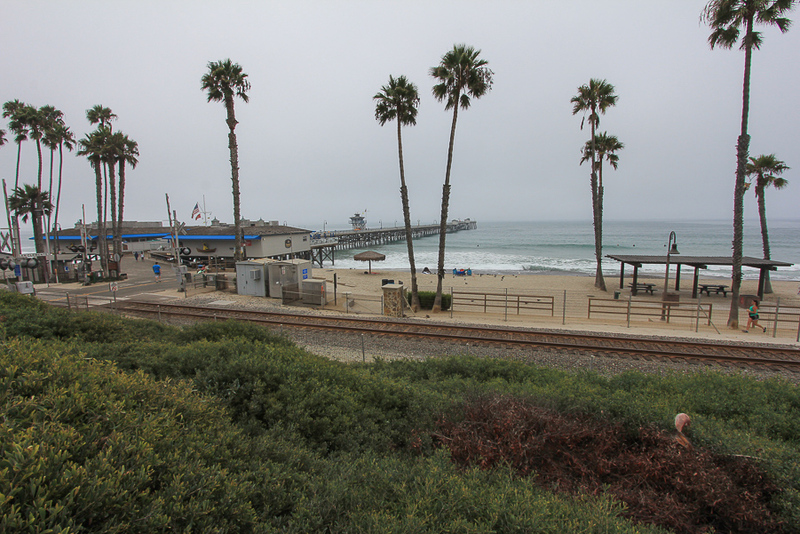 San Clemente is one of the first master-planned cities in California. 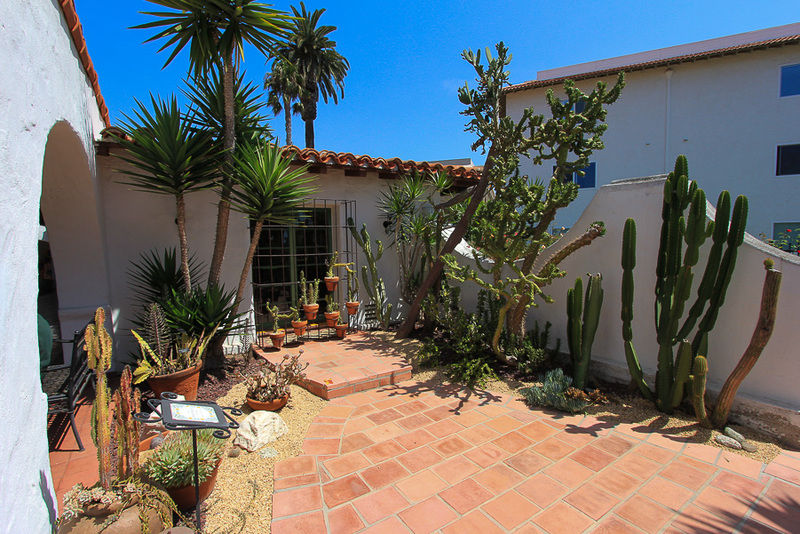 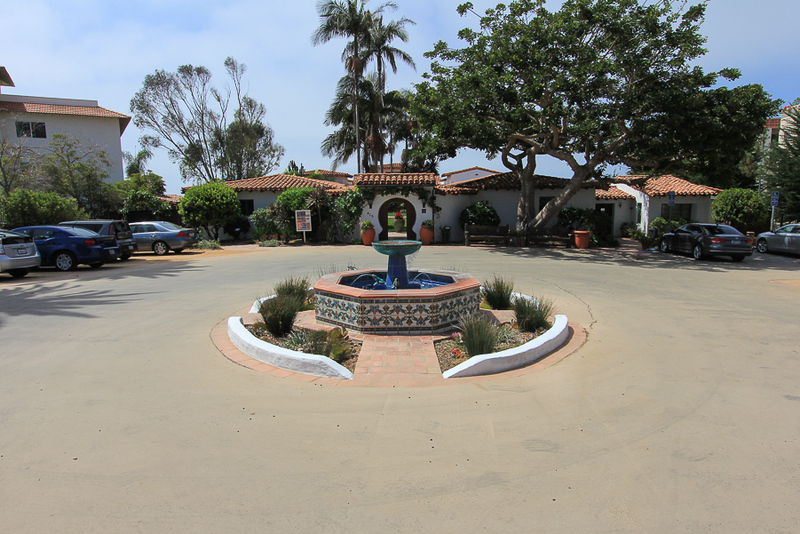 Co-founder Ole Hanson came to the site to create his ideal community, a “Spanish Village by the Sea.” In 1927, Hanson built the Casa Romantica as his family home that expressed his version of the California dream. 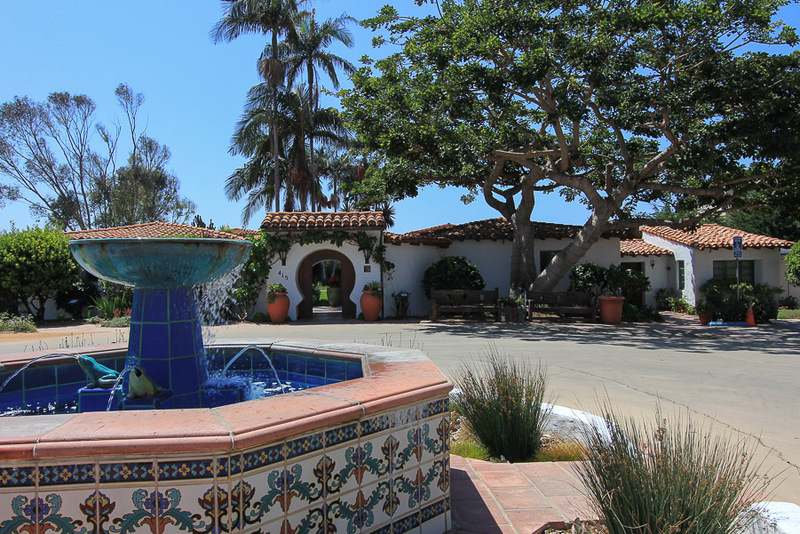 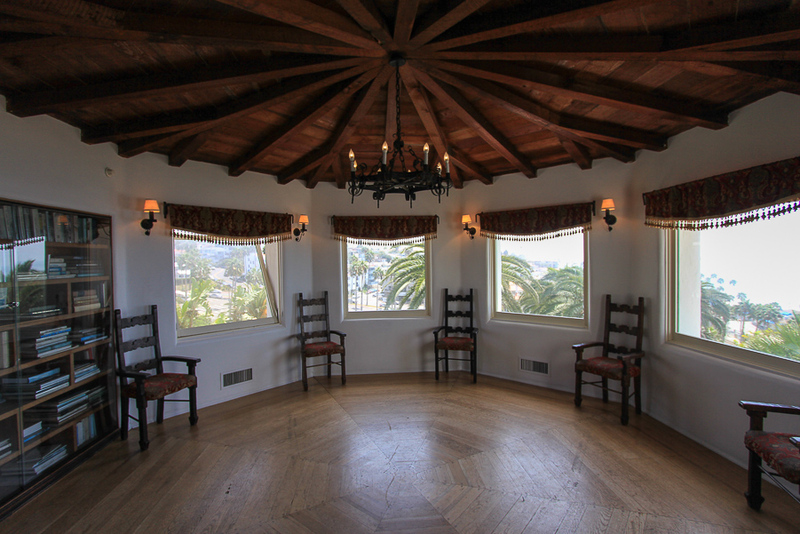 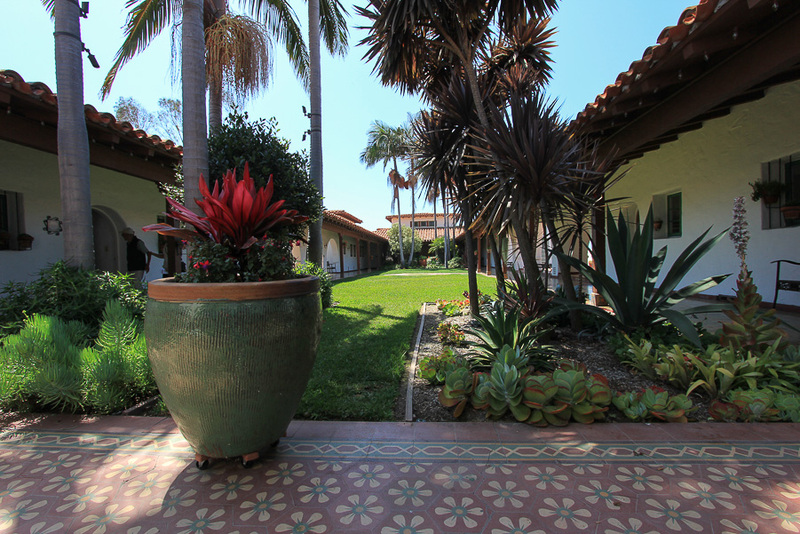 The seven-bedroom, seven-bath house was designed by Carl Lindbom, who also designed La Casa Pacifica (the former Western White House owned by Richard Nixon). 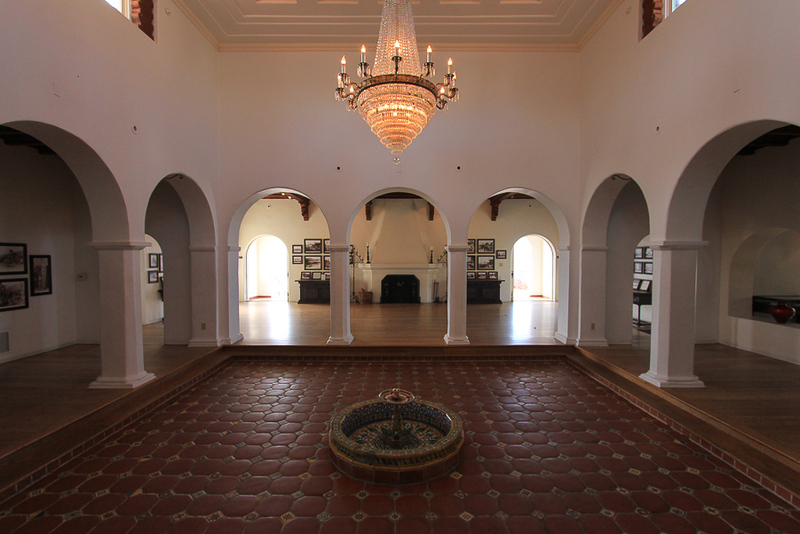 Hanson, who had wanted to become president as a child, built his own "White House" that included the finest materials, wood, and the latest innovations in construction. 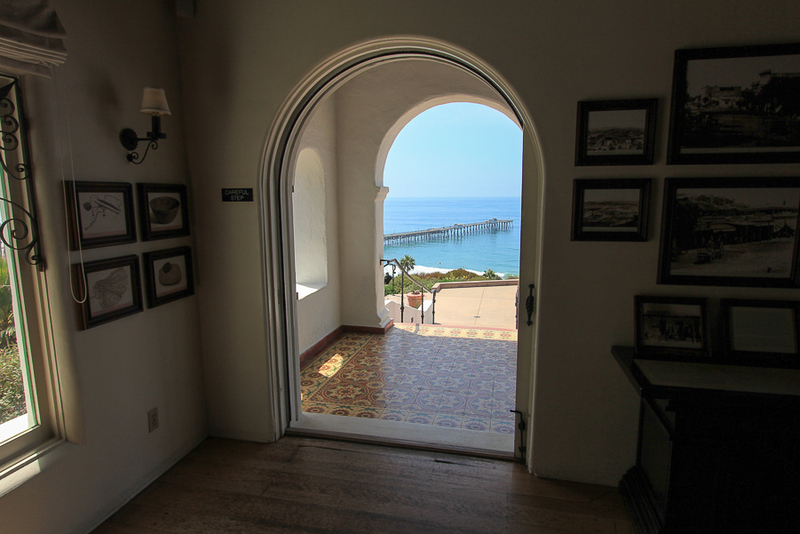 San Clemente is a beautiful town. 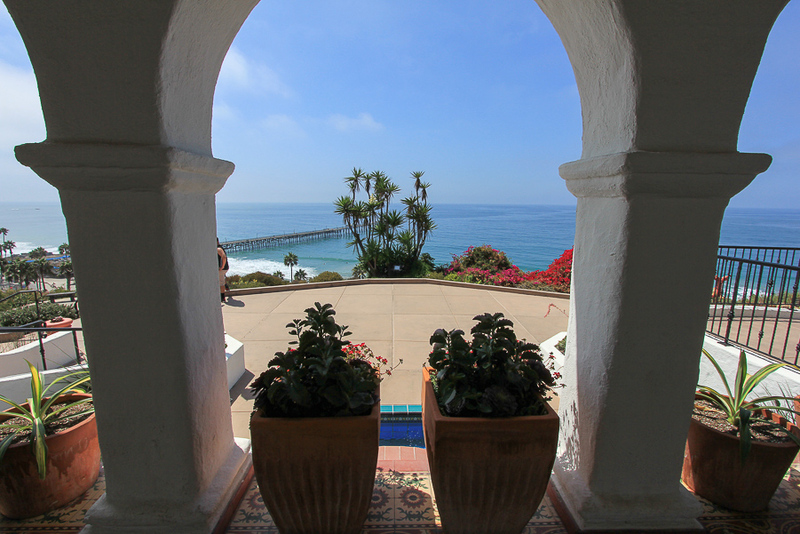 Casa Romantica is in the center of the picture on top of the cliffs and is easily identified by its large arches. 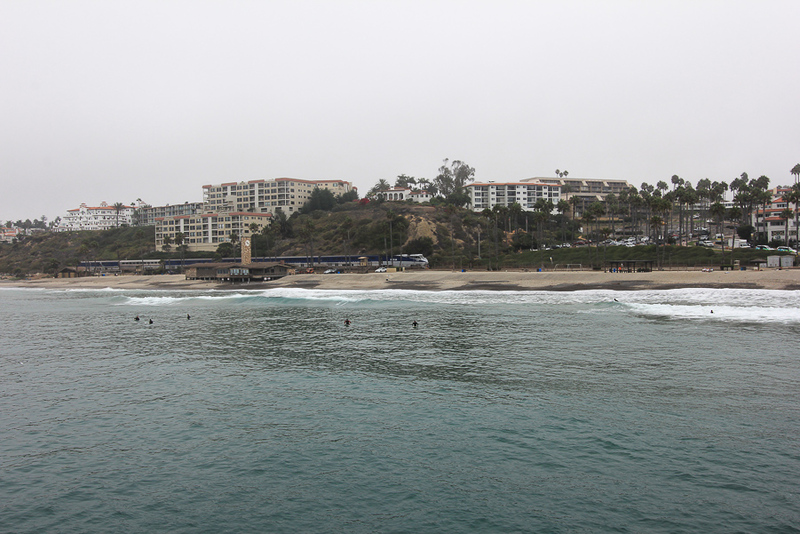 The Amtrak "Surfliner" is shown just below making its normal coastal journey. 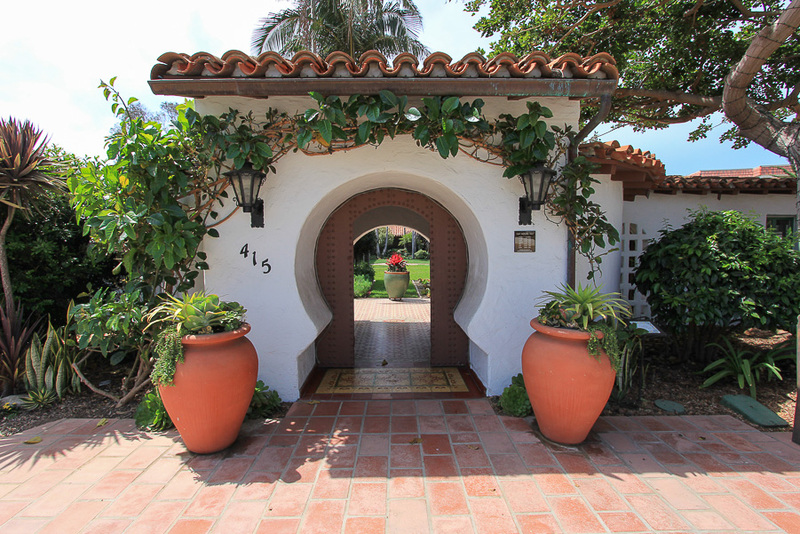 In Mediterranean architecture a "keyhole" shaped door means that someone important lives in the house. 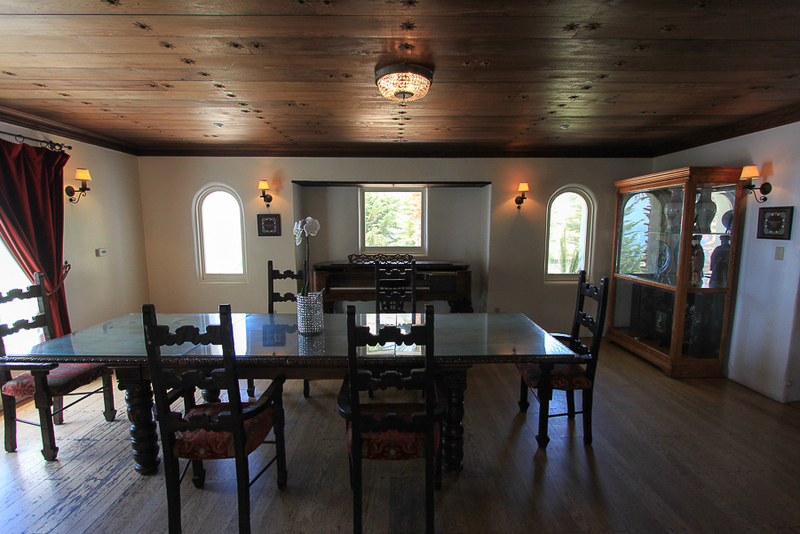 We had finished seeing about half of the house when Judy started imagining furniture layouts. 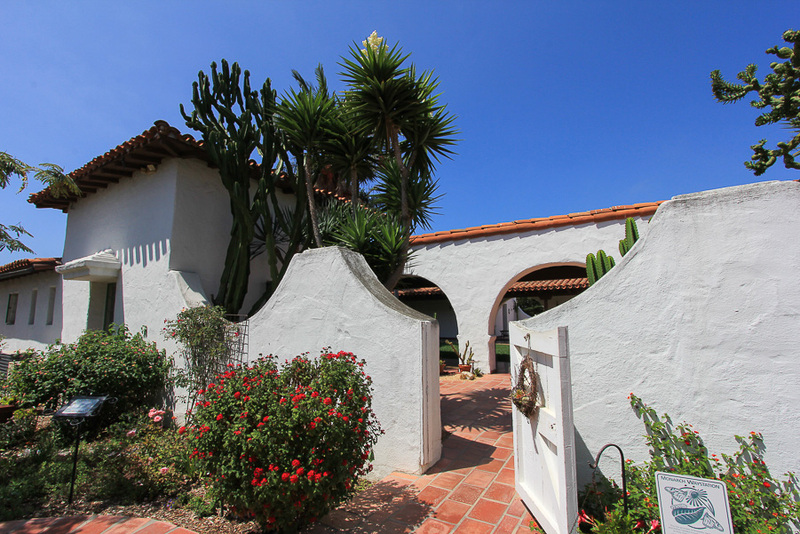 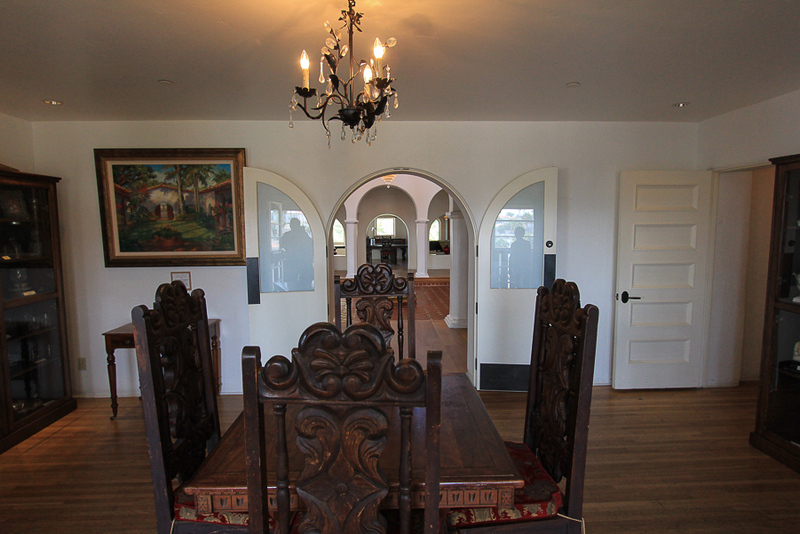 She thought that Casa Romantica would make a fabulous home for us. 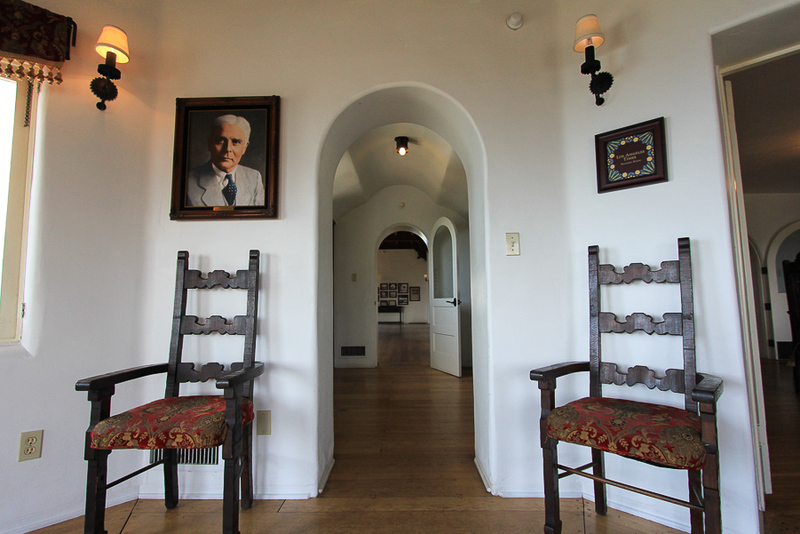 The portrait is of Ole Hanson and the ceiling in this small hallway is very dramatic. 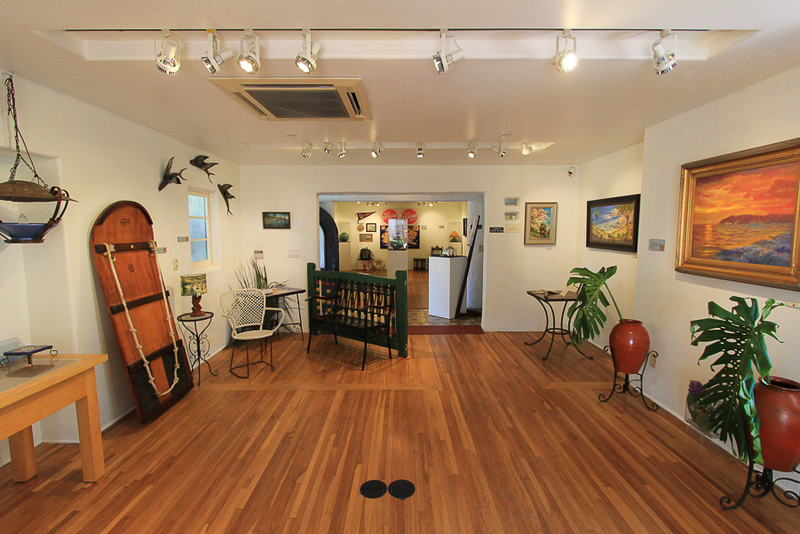 There's an exhibition gallery for rotating exhibits and the current one highlights the Catalina culture. 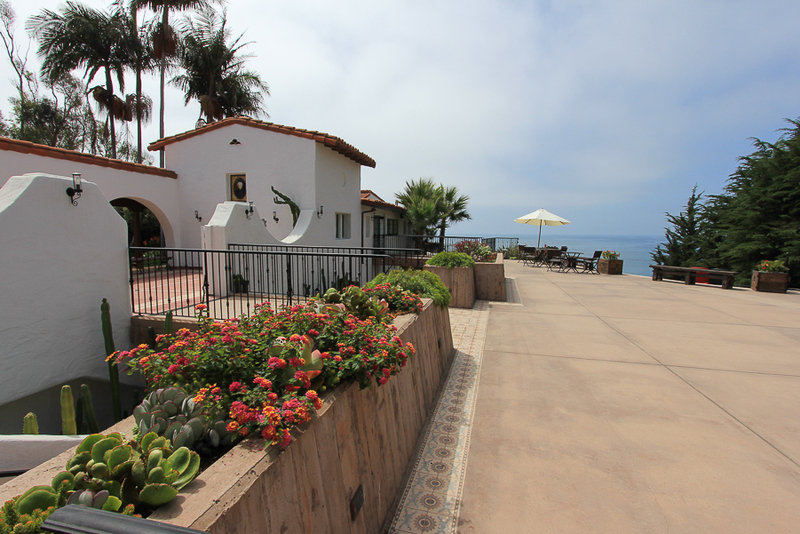 Before there were any water skis, people would stand on big boards like the one to the left and get pulled by a motorboat. 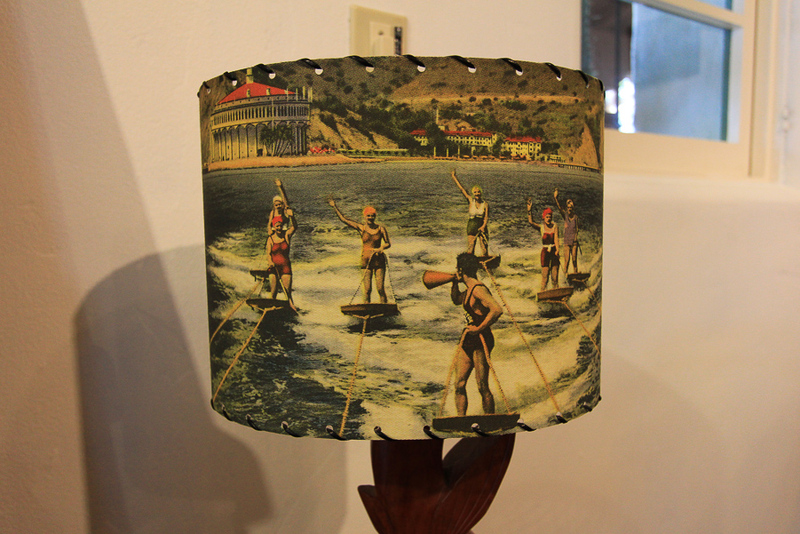 It looks like a lot of fun! 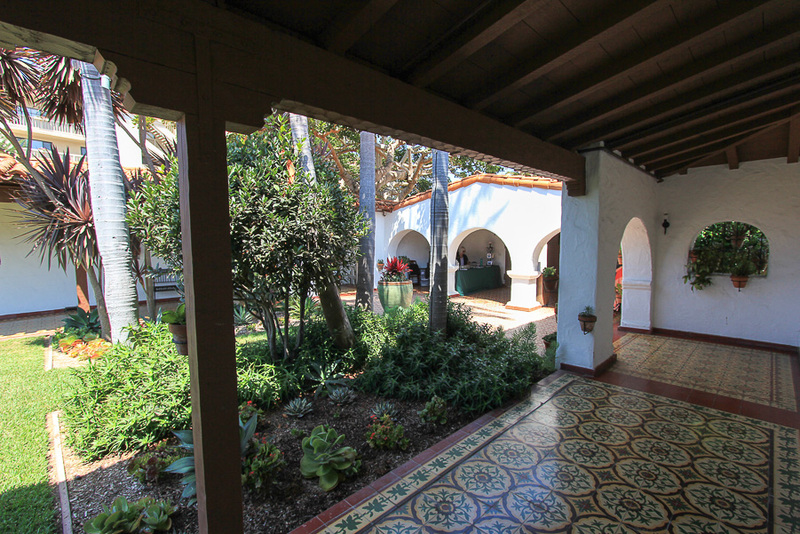 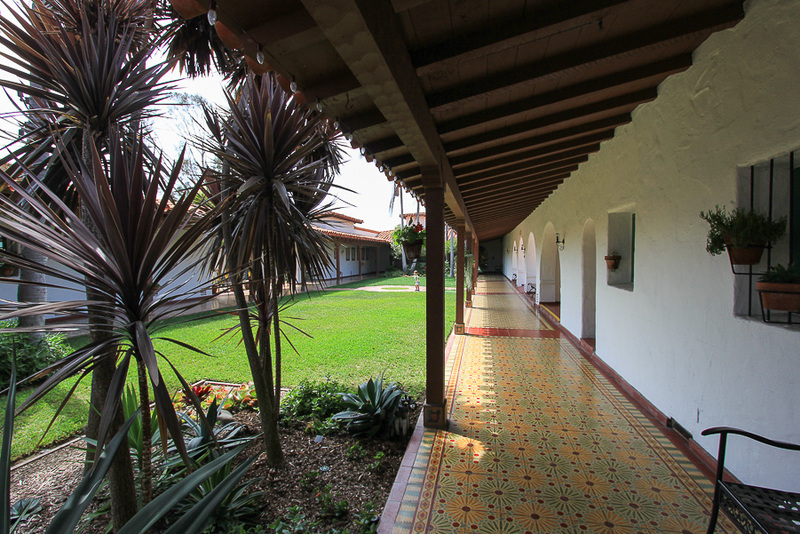 The design of the home, the tile work, the grounds and the view are simply breathtaking. 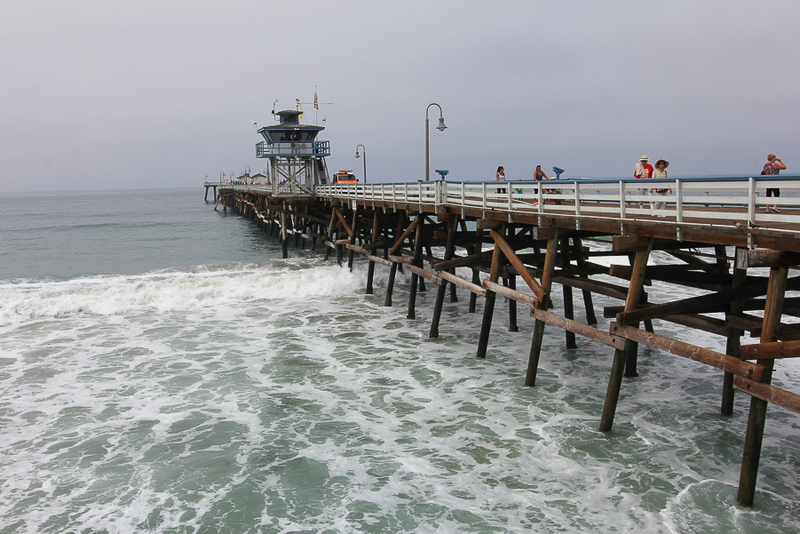 Before seeing Casa Romantica we had walked the pier and had lunch on the pier at the Fisherman's Restaurant. 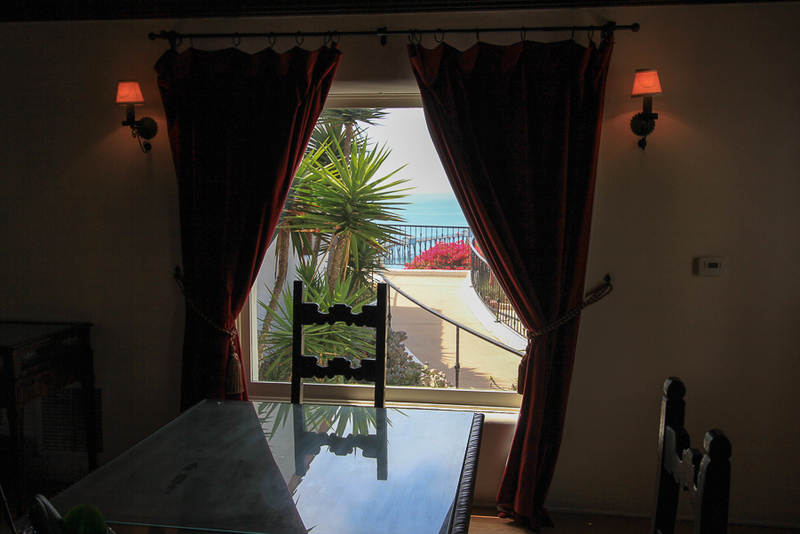 It's wonderful to hear the surf crashing beneath you while enjoying a great meal. 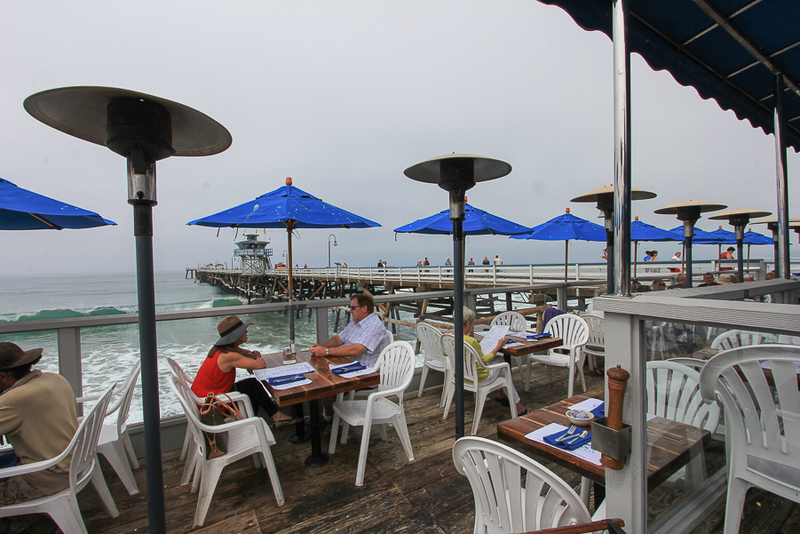 Judy had their Shrimp Scampi with garlic butter and white wine and I had clam chowder to start and then a big bucket of steamed clams to finish. 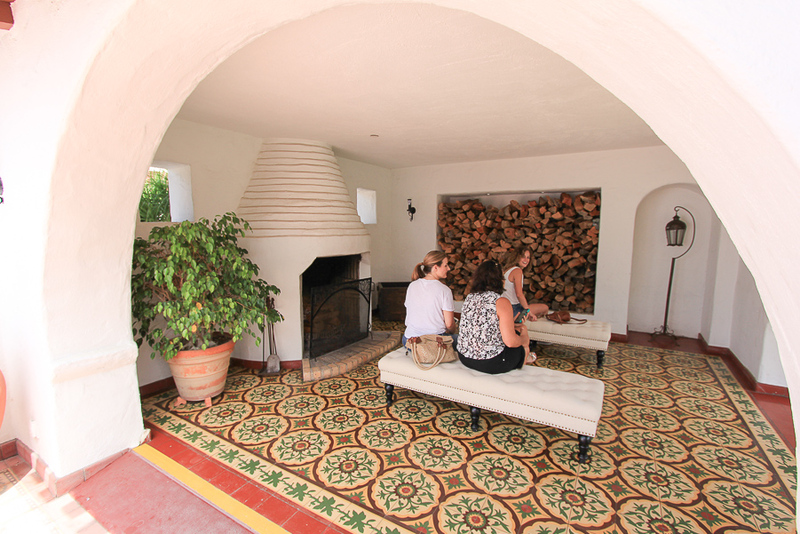 The food is excellent here!